eCycleElectric LLC announced today that Wei Wei, (Vivian), previously the China Operations Manager for eCycleElectric, has been promoted to Managing Director, China, eCycleElectric LLC. "Vivian Wei has developed leadership and sales skills that have made our China operation profitable on it's own, and supported our international operations and customers in a way that really makes me proud to have her as part of our team," said Edward Benjamin, Senior Managing Director. "Having her as a managing director makes us stronger and increases the quality of our service to our customers." 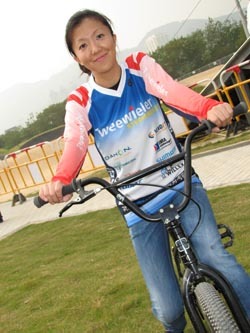 Wei Wei is also heavily involved with the Light Electric Vehicle Association, publishes columns on electric bicycles in Bike Europe, China E Vehicle, and has presented at EVS 26 and numbers of conferences in China, Taiwan, and elsewhere. Wei Wei, a native of China, holds a Masters in Cross Cultural Communication from Shanghai International Studies University and speaks perfect Mandarin and English. She is based in Suzhou, China, and focuses on eCE customers from China, visiting China, or buying from China. "Unlike many companies working in China, eCE works on a fee for service basis - representing the best interests of our clients and refusing to accept commissions - thus avoiding conflict of interest. Our 16 years of focus on electric bikes, motorcycles, and components gives us extensive contacts and friends in both the Western and Asian light electric vehicle business," Benjamin stated. eCycleElectric LLC is a consulting company serving electric bicycle, electric motorcycle, battery makers, motor makers, bicycle parts makers, user interface software and technology developers, with reports, advice, planning, and contacts since 1996. The team of 9 full and part time staff live in USA, Germany, China and Taiwan. Between them, they speak 7 languages, and have more than 50 years of cumulative experience in the LEV industry with customers that range from small inventors to the largest manufacturers in the world.